Indian Australian cycling ace Nosh Mistry has won a bronze medal at the 2012 Cycling Australia Masters National Championships. 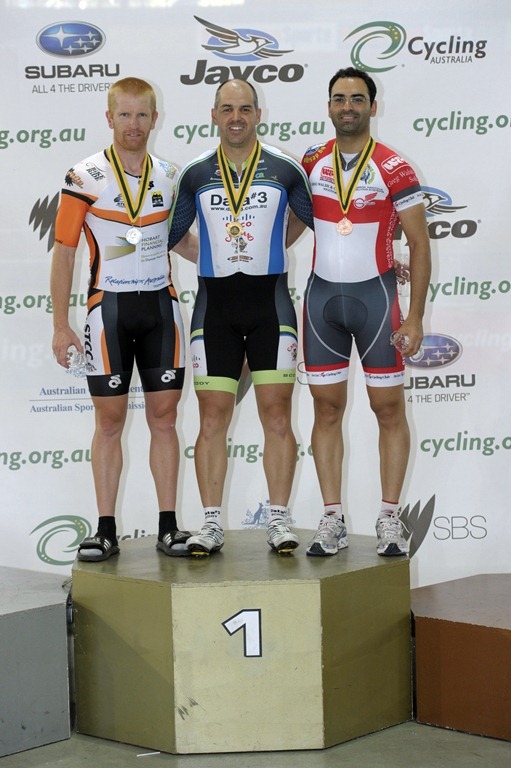 The prestigious annual event was held at the Dunc Gray Velodrome in Bankstown recently. 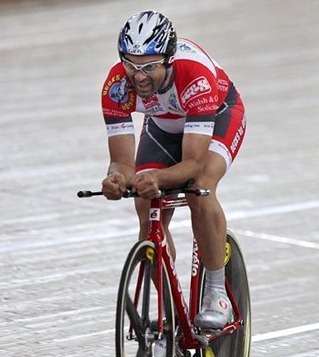 Representing the St George Cycling Club in the Masters 2 age category (35-39 yrs), Mistry competed in the 3000m Individual Pursuit as well as 10 km Scratch Race, winning bronze for the former. The CA Nationals are the highlight of the Masters racing calendar in Australia and will be followed up by Masters World Championships at Manchester in October. “It feels good to have reached a level where I am able to compete with peers of very high calibre in a very intensive sport”, Mistry told Indian Link. “It also feels good to be able to set an aim and achieve it”. “Of course, I have gone faster before, however given the conditions, it was my best effort on that day,” he added. “You learn from every race you ride and adjust certain things in training and testing which hopefully translate into better and better times. In a sense you are always racing against yourself, trying to go better than the last time”. According to Mistry, the 3000m pursuit, which takes place with 2 riders on opposite ends of the track, “looks deceptively simple, in that all it seems like is you get on a bike and pedal as hard as you can for the specified distance”. However, the training, the preparation, the diet, the mental aspects, the actual race, the lap timing splits, the aerodynamics, the body positioning, the bicycle, the attention to detail – all need to be dealt with. It tests the contestant’s mental and physical endurance. Usually the results go to the people who have put in the required time to address all the criteria, he stated. In contrast, the scratch or mass start race involves 24 people, who ride at the one time, with the fastest person over the line winning. These races are a bit of a lottery as it is not necessary that the strongest rider wins, observed Mistry who finished overall fourth in the category. Positioning in the race, tactics and the final sprint determine the winner. This is not a timed event either. However the average speed over the 10 km was about 55 kmph, so it was still a quick race, he noted. The professional cyclist has a grueling training schedule, clocking an average of 60-80 km daily. Typically his training year is broken down into specific phases of endurance, strength and speed building. In the endurance phase his daily weekday sessions generally include 2 – 2.5 hours of riding, while weekend races cover approximately 150 km, he indicated. The strength phase involves a similar session on hilly terrains to build up stamina. Finally, the speed phase, which is normally six weeks prior to an event focuses on target racing at a velodrome. Mistry’s competition year is split into A, B and C category races with A of course being the most important races where he strives to be at his peak. Thanks to a well-coordinated schedule from Cycling NSW and Cycling Australia, this is possible. And of course all this needs to fit around work and family commitments and very soon it become an exercise in time management, he quipped. Mistry’s wife and daughter are not only very supportive of his rigorous schedule but also accompany him to most interstate and overseas events, enjoying a working holiday in the process. As well the St George Club, of which he has been a member since his arrival in Australia over a decade ago, has been very supportive. and past world and Olympic champions, he acknowledged. share what they know and a genuine attitude to help is not something you get access to everyday” he revealed. “This has helped me learn a lot and apply it to my racing and training. Even though I live far from the club, I am still an active member”. 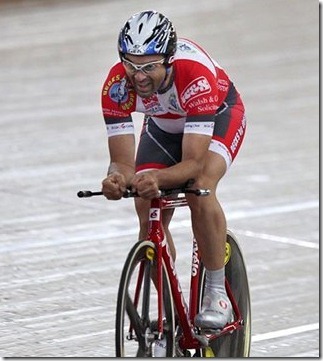 Nosh participates in around 75 races annually, his flagship events being individual pursuit and the road time trial. These events, he explained, require a similar physiology and training regimen and are classed as endurance events. This includes weekly races at the club, competing against Olympics level riders as well as state and national championships. The avid cyclist’s tryst with the sport goes back three decades when Nosh got his first bike from his uncle as a preschooler. “He still follows my career closely, offering pointers. Since then, I have been attracted to high tech bicycles,” Mistry confessed. As an adolescent he took up competitive cycling, winning his first national medal in India . Ironically, this was five weeks after a bad training accident involving a learner driver, he remembers. Having dabbled in a number of sports, cycling, Nosh discovered, was a perfect fit. Swimming and long distance running followed and Nosh went on to win state championships in both. He thus took up the triathlon and was soon named the national champion. This led to a job with the Indian Railways, representing them in numerous national events, while pursuing his MBA. continue my studies,” he admitted. In that sense it was both a passion and profession for a while. His only regret about competitive cycling back home, is the total lack of calendar management and information coordination. “In India , I wouldn’t know when state or national events are until a fortnight before the race. So there was no chance to be at your peak. This unfortunately continues to this day, preventing Indian competitors to perform their best at global levels”, he lamented. However, when you love doing something, it is not very hard to keep yourself going. When it brings results, which are recognised at a high level like the nationals, that is a bonus, he indicated. On a philosophical level though, it is just the simplicity of the activity of cycling and being completely absorbed in the moment that keeps him going. This motto gives Nosh a complete sense of purpose and involvement with life in general. So what drives the keen sportsman to sustain the momentum? Pursuing any activity to the highest levels requires tremendous physical and mental stamina. There are days when things will seem harder, however as with anything, persistence is the key. If you have discovered you have a talent for something, never ever, ever give up, he emphasised. Mistry is already setting his sights on the next event. After “two easy weeks”, he hopes to get back into the endurance-training phase and build up the volume of training and aim for a better outcome next time he competes in the same event. An action packed sporting calendar notwithstanding, Mistry also juggles a full time career in event photography. Meanwhile, if his performance targets are on track, a shot at World Masters in Manchester could well be in the offing.